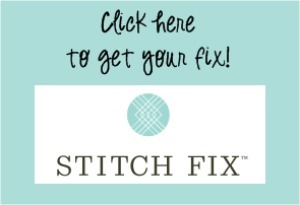 I have another batch of Stitch Fix goodies to show you today! This batch was really fun. Since people sometimes ask me the exact name of the items I’ve gotten, I thought I’d begin with a shot of the cards that come with each item. It’s kind of neat because each card shows two ways to style each piece that they send. (I laid the cards over top of each other, so you can’t see all the looks here). When I decide to keep a piece, I tape the card inside a cupboard door in my bathroom. That way I can look for ideas for accessories/outfits when I pull something out of my closet to wear. Then here’s a shot of the note that comes with each fix. My stylist visited both my blog and my Pinterest style board, and this time she selected items to coordinate with my latest thrift store find (shown here). How fun is that? Not every note is QUITE that personalized, but I love that she was thinking of what might work with things I already own. So here’s the first item– the grey hi-lo t-shirt. You’ll have to see the bottom edge on the card as my daughter didn’t quite get the whole shirt in this photo. I wish it was a tad more flowy and loose. And it is pretty plain without some jazzing up. But still, I could see myself wearing it often as it is super comfy and very versatile. However, at $44, I am tempted to look for a similar style elsewhere. 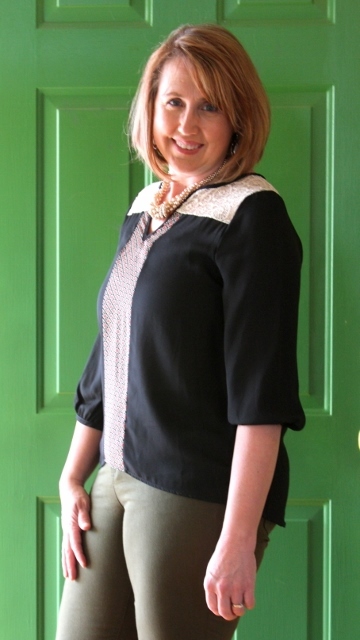 Next up is the Mark Lace Detail Blouse. The shoulders are actually a lace insert, which is very pretty, and it doesn’t go so low as to feel bare. Not completely sure about the style — I like it but wish it was just a little longer. Another down side is that this top came with a tiny tear down near the hem. They are offering a replacement to be sent to me, or a 15% off the cost if I keep this one. It’s $34 and I think I could easily fix it. But like I said, I’m not 100% sure how flattering the style is on me. Next up is this navy Kahlo knit top. It has the same lace detail as a tank top that I got last summer. I love the turquoise, and the length of the top. It feels flattering and comfy. But I am not sure how I feel about it when I see it in the photo. And I am puzzling as to what would be best on the bottom. My daughter said the olive skinnies in the picture are fine with it, but I feel like the bright clear turquoise makes the olive green look boring and muddy. Blue jeans would be boring with all the blue in the top. Not sure about black and blue together either. Turquoise skinnies would probably be adorable, but I’m not sure how versatile pants like that would be as a wardrobe piece. What do you think would be good with the top? Finally we get to what I feel like are the clear winners– the Callie Denim Jacket and the Denna Skinny jeans. The jeans actually are the ones I wore in the last photo too, but I’m happier with the way they look with the grey tee and the denim jacket. 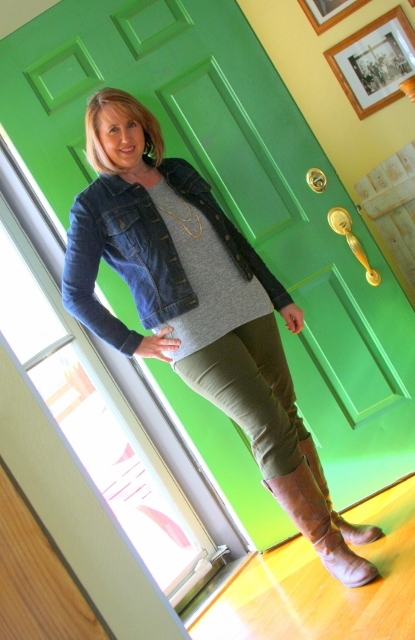 And as for the denim jacket– I do already have one, but this one is very light– almost shirt-weight denim, and has nice trim sleeves that I think is more flattering and better for warmer weather than my old denim jacket. You can also see in this photo that the grey hi-lo is a good underneath piece. In the end, I’m definitely keeping the jacket and the skinny jeans, but I am waffling about all three of the other tops. Help a girl out– what do you think? 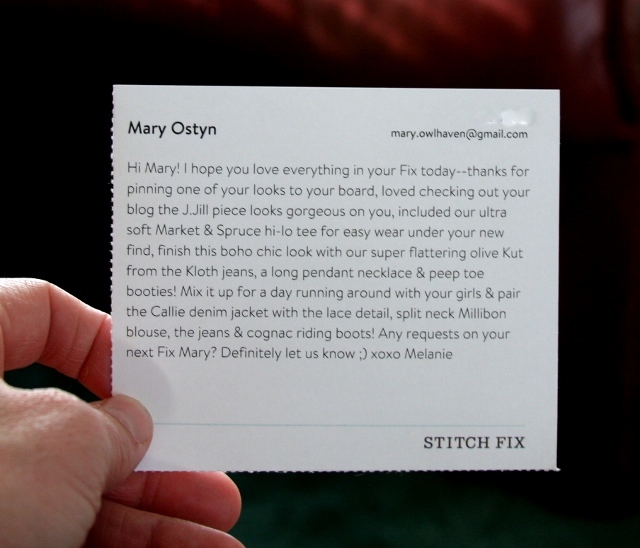 If you’d like to try Stitch Fix for yourself, click here to fill out a style/preference profile And be sure to share your pinterest style boards with your stylist as well, since that will really help her choose things that feel like you. All the links in this post are affiliate links, which means that if you sign up and get a fix, I will earn credit toward my next fix. And remember– if you try the service and like it, you can earn credits by referring your friends too. I adore the Kahlo top!!! What about white pants – or even a light tan/khaki capris or skinnies? Yep, that jacket and the pants are the winners. So flattering! The other three are all meh and/or odd and I’d say skip them all. I totally agree with Amanda. The gray t-shirt would be versatile, but I think you could find one similar at a better price and color for you. I don’t really like the lengths of those tops on you – they’re not very flattering. That gray shirt in particular cuts right across the widest part of your hips, drawing the eyes there and creating a wider shape than even exists. I’d be interested to see how you would look with a line across your true waist as the denim jacket is close to your true waist and is definitely the most flattering. I wonder if you found higher waisted dark skinny jeans (blech – seems impossible to find any higher waisted pants that are actually nice anymore and aren’t skin tight! I’m on the lookout for myself…) and either tried tucking in a shorter top or attracted the eyes to your true waist with a belt or pattern over a longer shirt. I love the jeans and jacket, and I like the grey shirt but it just looks like a basic tee you could get at Target, so I wouldn’t pay that much for it. (Off topic, I love your boots too!) I like the coloring of the khalo top but the way it hangs isn’t very flattering, in my opinion. Can I just say how much I love your green door and yellow wall? 😉 Okay, I love the pieces you love too. Agree that none of the tops are worth it. I suggest you try NYDJ Barbara Modern boot cut jeans with the tops above In a dark wash. Also QVC is a good place to find longer, flattering tops in fabrics that are flattering and not too thin. the jacket and skinnies are awesome. 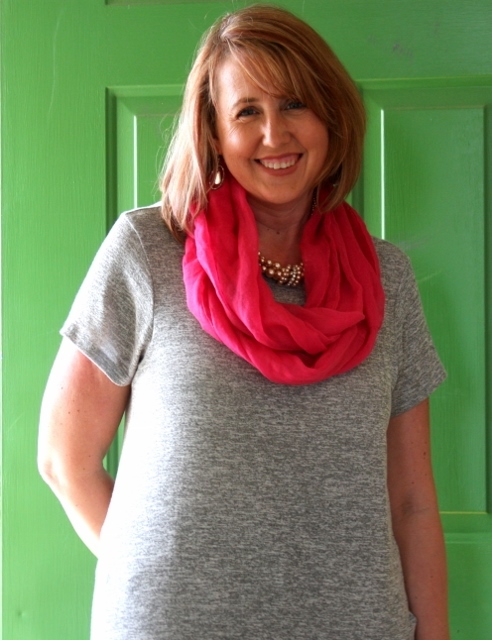 The kahlo top also looks great on you. You could wear it with lighter blue colored jeans, or khaki, or white in the summer. Also could try black skinny jeans.